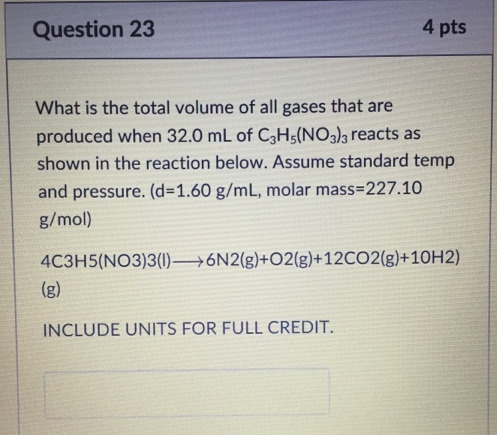 Solution: What is the total volume of all gases that are produced when 32.0 mL of C3H5(NO3)3 reacts as shown in the reaction below. Assume standard temp and pressure. (d = 1.60 g/mL, molar mass 227.10 g/mol) 4C3H5(NO3)3 (I) → 6N2(g) + O2(g) + 12CO2(g) + 10H2 (g).